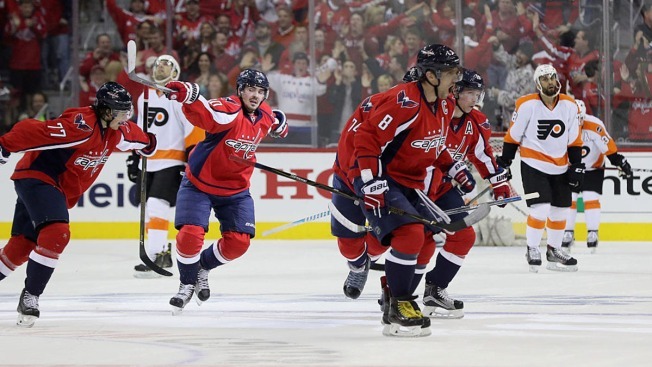 Washington's Braden Holtby made 41 saves, Philadelphia's Steve Mason gave up a goal from 101 feet away and Alex Ovechkin scored on the power play and the Capitals beat the Flyers 4-1 in Game 2 Saturday night to take a 2-0 series lead. Ovechkin's 37th Stanley Cup playoff goal was as predictable as Jason Chimera's goal from beyond the red line was unexpected. Mason whiffed at the puck on what turned out to be the game-winner. The Flyers outshot the Capitals 42-23 and dominated for much of the game, but came up empty as John Carlson scored his second power-play goal in as many games and Nicklas Backstrom added one at even strength late. Jake Voracek scored the Flyers' only goal.